ooVoo Voip App for Free Video and Voice Calls : Free Download | Free Pc to Phone Calls, Free Voip Calls to India International ! With the change and advancement in technology, the mode and way of communication also change. Letters and telegrams are out and it is the era of mobile phone and voip. Voice and video Calling is getting very popular and lot of people now make calls over internet. If we talk about voip calling (specially video calling), Skype is one service which is very popular. However there are some new entries in the voip market and these are also big name. We are talking about the new voip service named "ooVoo". Though it is a new service, however the features and promotions it is offering has already made this service so popular. It already has a huge customer base. So we decided to review ooVoo (which offers voip applications for almost all the devices). It is a complete suite of communication. Voip with high quality Video conferencing is the core base of ooVoo. OoVoo is infact combination of Skype and Paltalk - World's No.1 Video Conferencing solution. Free Video Chat with upto 12 people at same time : Everyone likes video calling but trust me whats more interesting is video chat with multiple people. It is really exciting and it is free with ooVoo (paid service with Skype). Free Mobile Video Chat : The thing with many other voip services is that it offer app only for limited devices. Similar to Skype, ooVoo is a multi platform application. It offers video calling app for PC, Android, Blackberry, Windows Mobile, Nokia and other platforms. Its a complete app! Direct Integration with Facebook : If you have a facebook account and directly make video calls from your Facebook account. ooVoo has a seamless and direction integration with Facebook. Now video chat without leaving your FB account and absolutely no download is required. ooVoo on Desktop : Make Free Video Calls from your PC to a person using ooVoo on mobile. Record and send video messages. Record and upload calls to youtube. You can also setup a web chat room for free. ooVoo Web Call : You can Web Call anyone using your personal web call link. Post it to Facebook, Twitter, or send it in an email or IM. No download is required; simply post your group video call link to the people you want to see. In a single click, your friend can join you in a live video chat. Watch Video Together : You can have even more fun on ooVoo when you watch videos simultaneously with your friends. Just click the Watch Together icon located at the top of your contact list or at the bottom of your video chat window. A new panel will open. Next, type in a video title or keyword to find the video you want to watch together. Video Chat Room : You can create a video chat room where people can join and chat with each other. You can embed this video chat in your website, blog or social media account. - Screen sharing with friends. - Add a phone to a video call : Even if you are on a video call, you can still make a voice call to another friend and include him in this phone call. 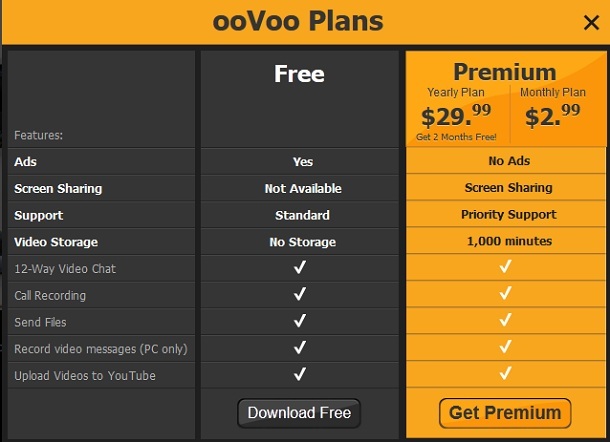 - ooVoo credits : You need to purchase credits in order to call landlines and normal phones (not using ooVoo on mobile). ooVoo offers crystal clear audio quality phone calls to landline and mobile phones, no fading or muffling. Calls to USA and Canada at 1.8 cents per minute. ooVoo is in short a social voip video conferencing solution which tries to go one step ahead of traditional VOIP softphones such as Skype. It tries to give users a much needed Voice 2.0 experience with high quality video streaming needed for high quality conference calls. We highly recommend ooVoo voip service and you must try it. It is free to download and most of the features are free to use.. with very less premium service.